This was the 8th year! This fun and inclusive family event aims to raise awareness of Down syndrome and promotes greater appreciation of those living with it. 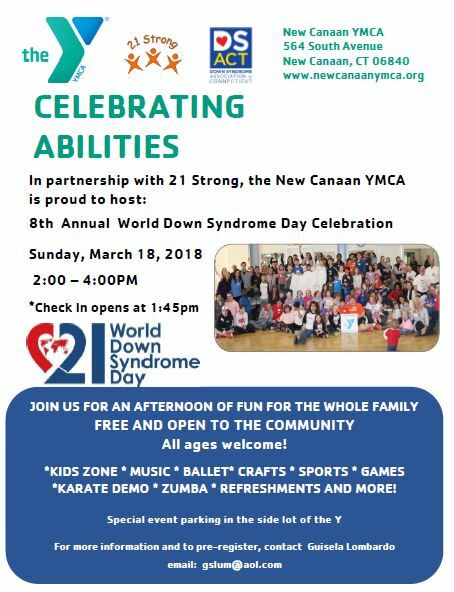 The annual World Down Syndrome Day celebration features activities for all ages, including a Bouncing Bears gym, carnival sports, floor hockey, basketball, arts and crafts, singing and signing, karate and more. It is co-sponsored by 21 Strong, the Down Syndrome Association of CT and the New Canaan YMCA. “World Down Syndrome Day was established in 2006 by Down Syndrome International, with the goal of raising awareness and mobilizing support and recognition of the dignity, rights and well-being of people with Down syndrome across the world. March 21, the 21st day of the third month of the year, was chosen to symbolize the third copy of chromosome 21 present in Trisomy 21, the most common form of Down syndrome."